Hello my lovelies! I have some fresh and cheery polishes to share with you today! The Colores de Carol Spring 2017 Collection consists of six colorful creme/jellies with shimmer, glitter, and other subtle details, one white crelly with matte glitter, and a holographic topper with multi chrome flakes. I also have a new matte top to share. Let's take a look! Hello lovelies! Today I am sharing with you the Collection 14 stamping plates from UberChic Beauty! Once again there were so many good images in this collection that I wanted to try out. I still haven't tried some of my favorites, but then I didn't want to make this post wait until I had. So without further ado, let's take a look! Hello my lovely Society Sisters! 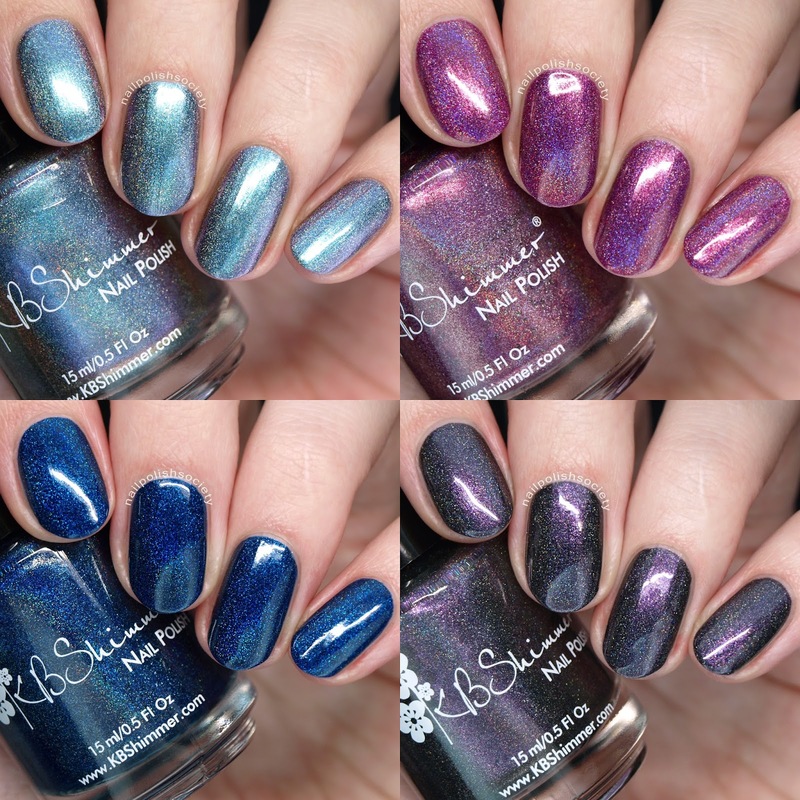 I recently purchased these four KBShimmers from this month's Hella Holo Customs, a Facebook group that hosts indie brands each month to create custom polishes. These are the first polishes created in the HHC group that I have purchased because they're KBShimmer and I knew that they'd be good. My package arrived yesterday and I couldn't wait to swatch them! Hey ladies! I was sent a pack of the new UberChic Beauty UberSwatchers, an organizing tool that is designed to fit atop your nail polish bottles to help you find the color you're looking for. They are one-size-fits-most stretchable rubber caps with removable white plastic pieces that are made for painting regular or gel polish directly onto. I have pictures below of 17 different nail polish brands that I've fit the swatchers onto. Hello my lovelies! It has been ages since I've done any freehand nail art. I've found that it's one of those skills that if you don't use it, you lose it. Not to say that I was in any way a master to begin with, but I could feel my abilities falling behind. So here's some nail art that I attempted with a detail brush. If it looks like I didn't have a plan going into it, that's because I didn't! Hello lovelies! How is your week going? The sun is warm and shining outside and I am getting really hopeful for Spring. Speaking of, I have some Spring appropriate polishes to share along with a stunning red duo. Four of these six Celestial Cosmetics polishes have similar formulas and finishes. They are slightly metallic, holographic, and each have a color shift- some more subtle than others. The formulas were all nice to work with, but did require three coats for me to reach the coverage that I prefer. Let's take a gander..
Hey everyone! Today I have for you swatches of the Essie Gel Couture Ballet Nudes Collection. You may have seen me post on social media about an event I attended at the Grand America Hotel where I received this collection along with new Essie treatment products that I will be sharing soon. This was my first ever event with other bloggers and it was good to get to know some local women from different realms of the blogosphere. We enjoyed some super fancy afternoon tea, something I didn't know I was missing out on but totally hope to do again sometime. Hey ladies! 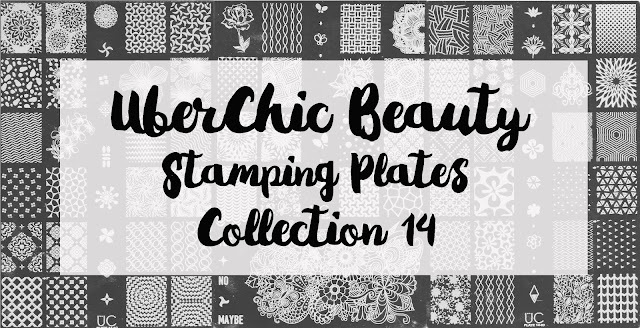 Today I have a review of two new UberChic Beauty stamping plates for you. They are both fun and festive and I had lots of fun with them. Take a look! For this first look I did a simple gradient stamp with a lovely and quirky double hearts image. Hey peeps! I have more long overdue swatches for you. It's pretty much the same story as my last post (read about it here and here). So even though I swatched these polishes weeks ago, I'm just now getting them edited and ready to go. The bad part is.. not all of them are still available :(. Sorry guys. I decided to publish them anyway because I don't want all my hard work to go to waste! I am back with swatches! I actually did these about a month ago but my computer problems delayed me posting them. I was out of practice photographing my nails so forgive me if they're a little irregular. I apologize that because this is so overdue I'm not showing the whole collection because some polishes aren't available anymore (including two that I am showing here). Moving right along.. Still Waters is "a slightly blue tinted base with light blue micro glitter, navy holo glitter and holo glitter". This is one of those polishes that I didn't know I needed but now that I have it, wondered where it's been all this time. This was two coats, no top coat. Even without top coat it dried down pretty smoothly.